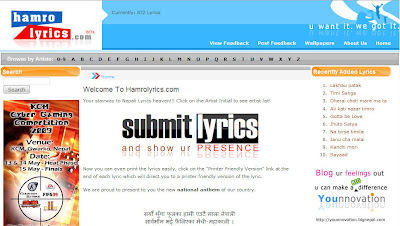 Hamrolyrics.com is turning 3 today, and YoungInnovations Private Limited (YIPL) is also growing at a formidable pace. It all started just 3 years back when we were in college and had plans to do things, make it big and now many things have taken shape. We own our company and its running good. Just to look back I’m being a little selfish in this blog post and want to be nostalgic on how I started web development, when did it all being and how. Visit Hamrolyrics.com. It looks good, all thanks to Anjan for his design. I guess it was early 2000 when I was in my 10th standard, I remember when I told people about email they used to be puzzled. In those times when people didn’t have an email address I had a website, be it a website in 50megs.com but I had a website then a decade back. I remember internet was a big luxury then, Thamel was the place to be to surf internet and it was amazingly expensive it was Rs. 3 per minute of internet surfing that would cost Rs. 180 per hour which is now around Rs. 20 per hour or so. So how did I get to the web designing thing, well my cousin Rajeev Manandhar (elder to me) owned a cyber cafe then. I had seen his website and asked him how did you make it, he said I used Frontpage. I was so into computers as I had got a new one some time back and no one around had one. I first saw his site and tired to make something like it. I jotted up a personal site and asked him to upload. I guess he was the one who created my hotmail address that I don’t use now a days. I’m into Gmail :). How the lyrics site started. After making some websites in plain HTML and some very mad designs with Photoshop, I wanted to do something usable. I wanted to give something that people would like to see, then when I searched for Nepali lyrics in Yahoo or MSN may be then Google was not there or was not that popular in around 2002. I did not find any good site with needed volume of content. Then I decided to build my own and started collecting lyrics. I had typed up more than 500 lyrics in between 2003 start and 2004 end so may be in around 2 years time. I just knew how to design things I had no web programming knowledge and with a dial up connection I could not get any tutorials or anything and yes in that time there we no blogs, no podcasts and no videos. Internet was just about email and surfing static websites like one I was building :). I was so passionate about the website that every week I used to add 10 lyrics and put each entry manually to the alphabets page as per the song and the artist. I even used to record songs from FM as they played the newest tracks I used to record from Naya Pusta (Radio Sagarmatha) as the program played new releases. I had put so much effort on the site but did not expect any return. It was my +2 days and I could use my time like that. I knew some ASP (Active Server Pages) in 2003 mid but did not prefer the new hosting and the new sub domain in brinkster.com. But after I joined my Bachelors I did not pay attention to the website. In Nepalilyrics.150m.com then I started to have bandwidth limit exceeded errors as almost daily the 20 Mb per day allotted bandwidth used to be insufficient. Then I tried to shift the lyrics site to Nepalilyrics.t35.com which had unlimited bandwidth and the two sites ran in parallel. The site now looks very funny I agree but 7 years back it was great when there was no Web 2.0 thing around. Even then I used to get so many feedback like include guitar tabs, you are doing a great job but on one to contribute lyrics or say I’ll help you. There are lots of feedback now as well : http://hamrolyrics.com/feedback_view. The major headache after 2 years + of continuous commitment and dedication was now updating lyrics. How much would I update the lyrics from a dial up connection till when, so I stopped it all after a point. I liked to measure the visitors and things form then so I had installed a tracking code in 20th Jan 2003 as the site mentions :). I used addfreestats.com not Google Analytics as I didn’t know about it 7 years back. The stats of the visitors to Nepalilyrics.150m.com in the past 7 years. The site was featured by Saptahik daily as site of the week on Falgun 16, 2059 BS, see it here (http://twitpic.com/131dae). I participated in Wave Web winner 2003 I guess my site was more popular than the awards :) but won nothing. 2003.com.np is down now. It was site of the month May 2005 in Nepalvista.com (http://www.nepalvista.com/som05.html). With hard work it was achieved but I knew from then it would have been profitable as well but the Nepali web audience is lazy and not responsive. I guess the only thing that sells in Nepali websphere/ web arena is “Model Pictures” - define it yourself, yes there are good blogs and forums but the average Nepali web surfer will never even look at a clean minimalistic design with great content. They will rather jump on a flashy showy “झिल्के” website. Sadly thats the only thing that sells here. We don’t believe in community building and I have not seen any community driven Nepali websites, I’m not talking about social networking or chat websites. Hamrolyics.com plans to come in a new avatar and with loads of new features. The website is built with Drupal and thank to the genius Bibek Shrestha (@bibstha) and his untiring efforts to make Hamrolyrics better. Also many thanks to the whole YIPL team including Anjan, Prashant, Sangita, Rabindra, Sanil and all others for not letting down my dream of having a great Nepali lyrics website, but now we should take a different approach. We want to handover the website to the community any interested person or group of people are highly encouraged to contact us at [email protected]. For now you can see the new site beta at http://new.hamrolyrics.com. I really want people to come forward and take ownership in Hamrolyrics, after all its Hamrolyrics :).